Humbly promoted as a photo editing site, Canva is actually so much more. Useful to both amateurs and even professionals, one can create anything and everything from avatars to icons, cards to fliers, and website graphics to visual presentations. 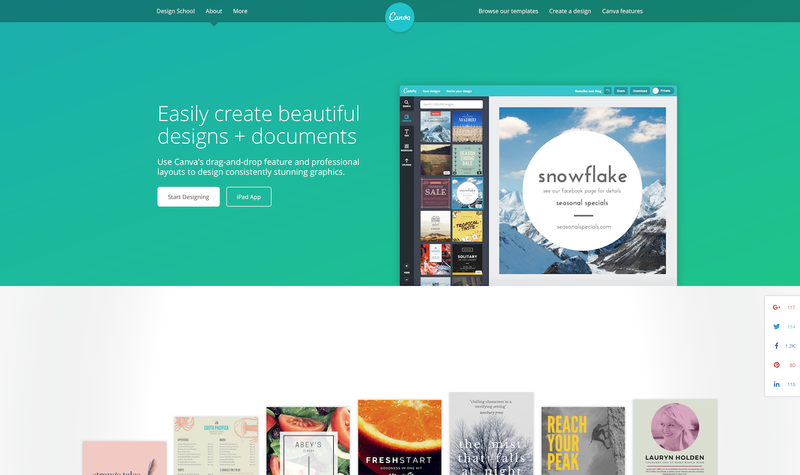 With ready-made backgrounds, borders, and design templates to choose from, Canva is incredibly easy to use. Employing intuitive controls such as drag-and-drop, adding, removing, and editing elements on your masterpiece is straightforward. The program even offers built-in tutorials to guide you along as you familiarize yourself with the environment. In Canva you can start a project while at work, then saving it and continuing from home (or vice-versa). Also, the enormous repository of images that the software offers should satisfy all your designing wants, however, should you need premium images, they charge only a dollar each. Connected tip: Browse around their website before you start using their awesome software. Seek for inspiration at https://designschool.canva.com/ .